Sports franchises which see a yearly release often go through peaks and troughs in quality. It should be expected when you consider the limited development time on offer, but it is an important thing not to let a trough become a slide towards mediocrity. While I don’t think Sports Interactive are in danger of allowing their Football Manager series fall into terminal decline, their latest release feel extremely half-baked. I’ll be straight up here, I haven’t spent as much time with the new game as I normally do with a new Football Manager, so please don’t consider this to be a review, rather a few thoughts on what is right, and not so right, with the latest in the series. From what I’ve seen though, this is a release with a lot of ideas that have been thrown at the wall without giving them enough development time to properly mature. It’s a similar story in some aspects to last year’s game which I had issues with at launch, but rather than take the time to refine what didn’t quite hit the mark from last year, it feels like new stuff has just been added with the expectation it will be enough to get people to buy-in to the game again. 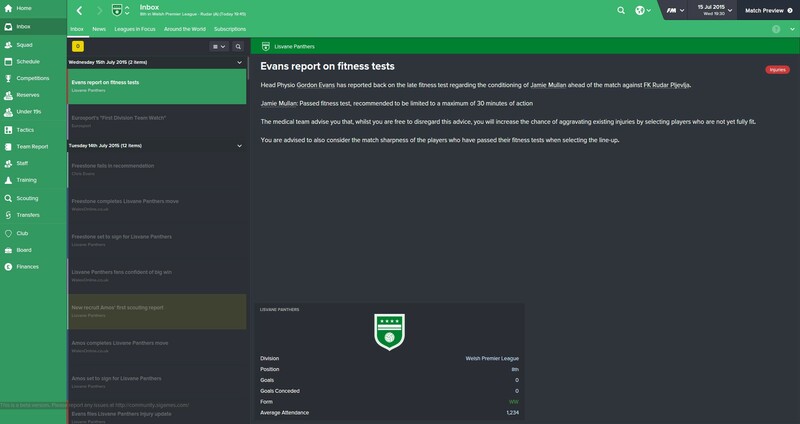 Take for instance, the combination of the ‘Manager on the Touchline’ and ‘Create a Club’ modes. 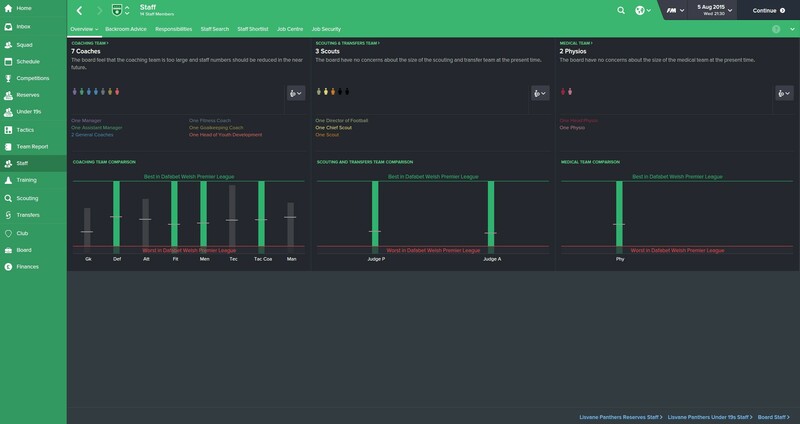 During the Beta, I put together a little guide to the Create a Club aspect which included the creation of my very own manager profile. Take a look at the manager creation options, and tell me that is what you would expect from a big-hitting game in 2015. It looks downright amateurish with limited options resulting in something which barely looks human. It might be (loosely) tied in with the manager skill points that were introduced last year, but it all feels underwhelming. It is especially so for someone who tends to zip through matches like a flash. I still hold a candle to the pre-2D match engine of yesteryear, and so having my (hideous) creation on touchline means nothing to me. 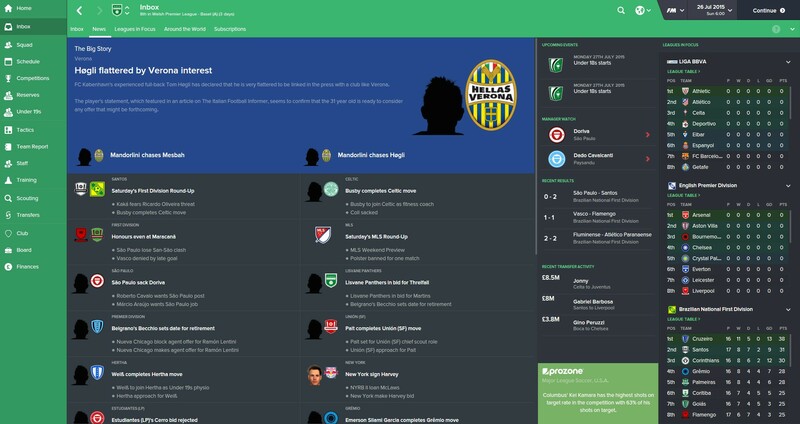 The Create a Club mode will be something which armchair Football Manager fans will undoubtedly enjoy. The chance to add your own local club to the game in place of a Chelsea or Man City sounds like great fun, and for some players, it will be. For others who have an understanding of what you can achieve in the Editor, this will come across as an option that is greatly lacking in depth. 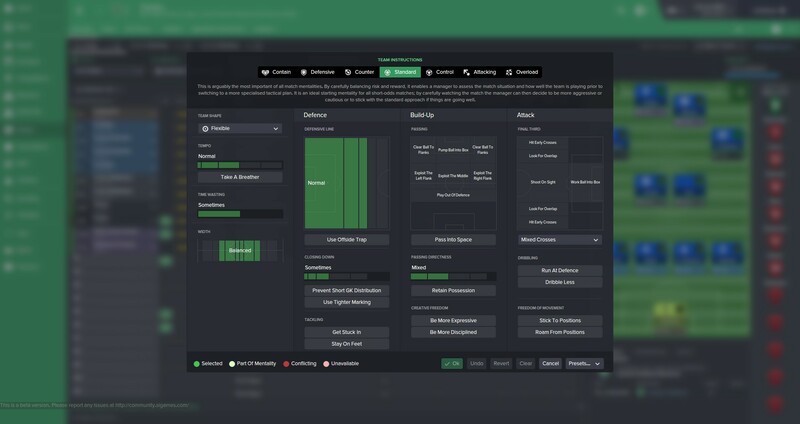 Jump into the Editor and you can change league details, make new continental competitions, add as many new players as you wish and generally wreak havoc with the database. Things might not always work properly, but the depth of changes you can make is awe-inspiring. The Create a Club mode pales in comparison. Something like the Fantasy Draft mode (see above video) has great potential, but sadly is being marketed towards online play only. What about the days when you are doodling around in the wee hours with nobody else online, and you just want to create two super teams yourself and see them go at it? It can be done (as I have shown), but by tucking the option away in the multiplayer menu, many people won’t realise what they can achieve by themselves. If SI want to let us indulge our inner fantasy football manager, why not really let loose and let us go wild? 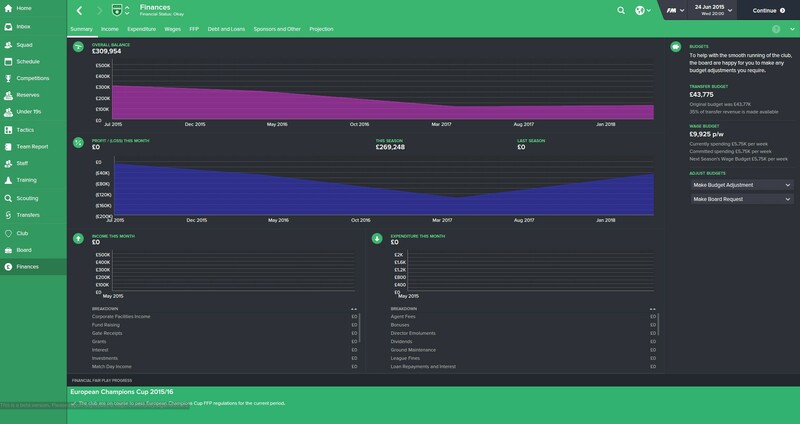 Do away with budgets and having to replace another club and give players an easy way to create a mini-league populated with clubs of their choice and as much money as the want. The options are there in the database, I just wish SI would have taken the Create a Club and Draft modes and reached the potential of both by holding them back for another year or two. The trouble is, if they had done that, what other new features would there be to advertise with the game? Multi-match highlights for other matches might sound fine on paper, but how many (apart from the really dedicated) are going to spend their time with that, especially when you look at the 3D match-engine and compare it to FIFA. I’d happily sit back and watch some FIFA pros (or the AI) go at it, less so Football Manager. Press conferences see more varied questions being thrown your way, but there is still a detached feeling to them and their impact on the wider game. The refreshed News view neatly captures the world headlines, important league standings along with the ProZone statistics. Some of the advice you receive from coaches and physios is of real use now. This is tied in with the an overall change to the injury system, and is certainly a good thing. The initial scout report the lands in your news screen gives you everything you need to know in one place. Less clicks to see what you need – a good thing. Sadly though, some screens have been made more confusing. A lesson that more detail isn’t always a good thing, and nor is changing menus around for the sake of change. I love delving into club finances. The summary screen is fine at the start of the season, but as time goes on, it becomes more cluttered than it needs to be. Why do I need to know some of this information? It is a mess for someone like me with colour blindness and could have been presented much better. Perhaps the biggest thing which is putting me off is are the revised tactics screens. I don’t think I like anything about the changes SI have made here. The Team Instructions that you can see above? Atrocious. The plus side is that coaches will recommend changes for different matches. Better to follow their recommendations that use that. 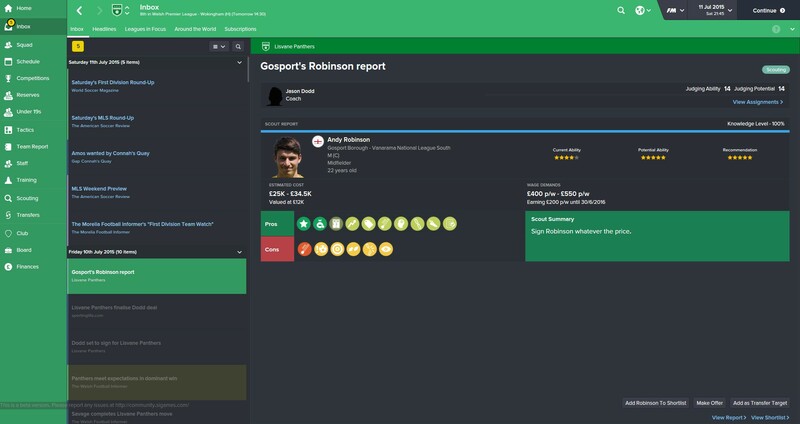 I think it is safe to say that Football Manager 2016 isn’t for me, and I don’t think crafting my own story after playing with the Editor will do the job. I have faith in SI to turn things around next year, and I’m sure the new ‘Touch’ version is going to be great for those who want to play while on the move. But for a big screen, proper PC player? I’m going to stick with last year’s edition. It all begs the question, would SI be better placed to change their approach to the series entirely? That is something to ponder for another time.